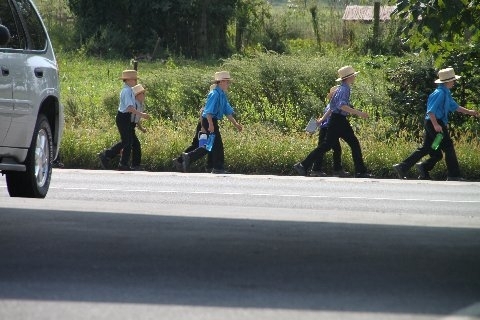 School has been back in session in Amish Country, and for that matter much of English Country, for a few weeks now. 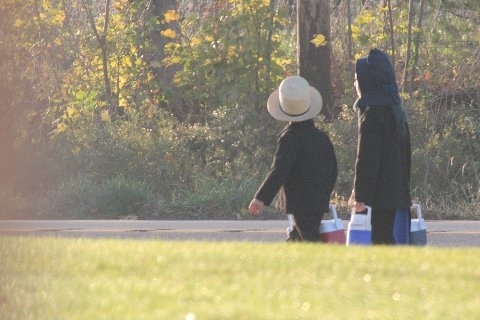 Ask an Amish child how he feels about going to school and you’ll get a range of answers, just like you might hear from his non-Amish counterpart. Some enjoy it very much and look forward to the return of school days. Others would rather be outside, doing stuff. Speaking recently with a young Amish teen approaching the end of her academic career, I could tell she was probably going to miss attending school. Yet many are glad when the final bell rings on their school years. Boys especially, it seems. 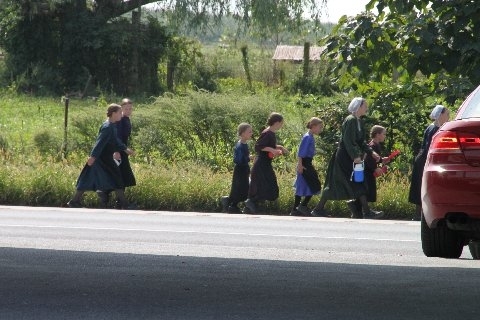 Contrary to belief, for some Amish children eighth grade is actually not the end of formal education. In communities in Pennsylvania, they must attend what’s referred to as “vocational school” until their 15th birthdays. This typically consists of a few hours of teaching one day per week, often German language lessons among other subjects. This extra ed may be held at the private home of the vocational school teacher. If a child has a late birthday, they may even continue this for a full year plus part of another. Students are also supposed to keep journals of their activities over this period. 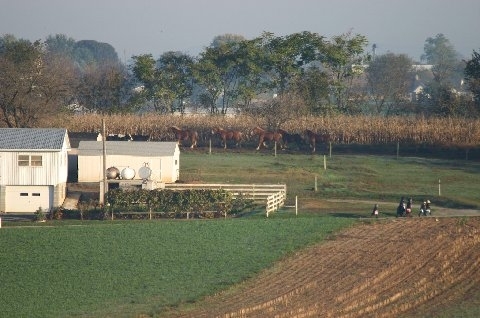 The photos today were taken by reader Ed, on the way to, from, and during school in various parts of Lancaster County. Taken during visitor’s day at one school. Heading home to the fun of work and play. Did you look forward to school’s return at summer’s end? Or dread it like I did? What back-to-school memories have stuck with you? Rich, what a great book promotion. Now I want to read it! Although I doubt that he would acknowledge it, “our own” Rich(ard) Stevick makes some very insightful points on Amish formal and informal education in his own fine book … Growing Up Amish: The Teenage Years. I am reading it now and it is a very good read. Glad someone else suggested it to me, as I am doing for the rest of you! My recently retired elementary school teacher / bride has been the recipient of my reading some of the pages of this book out loud. I think she may give my oral reading skills a “Needs Improvement”, but won’t say so! (insert winking smiley face here). By the way, after 36 years she did NOT miss going back to school this year. The Xena the dachshund is happy to have her home on her endless summer and quite frankly so am I. My husband is a school teacher w/ an hour commute each way. 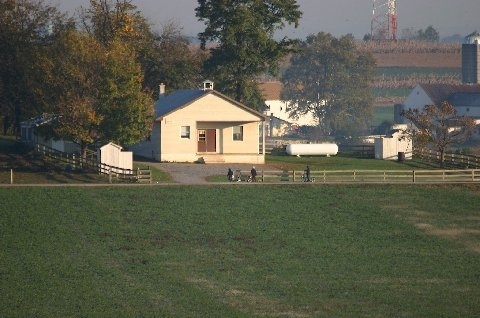 Yes, we get two months together as a family in the summer, when we pretend to be farmers on our little 3 acre homestead. The other ten months of the year are a huge sacrifice. Just as the temps cool down and the landscape turns lovely, we don’t get to enjoy it together. Naomi I should have asked about the teacher’s perspective as well…thank you for sharing it. I wonder how year-round school would compare vs. the long break model. I remember hearing about the exotic, slightly terrifying concept of year round school as a boy. I never experienced a year-round school schedule, but from how I understand it works, with periodic multiple-week breaks, it now actually sounds somewhat appealing. I have friends who’ve taught in year round schools and loved it. Makes sense to me. I always looked forward to school returning when we lived in Ohio because I got to see friends who I had not seen all summer. That was short lived however and soon looked forward to it ending. When we moved to Florida I never looked forward to school beginning again as I wanted to be on the beach. John Lueders, you’re not the only one with that kind of dream! Mine involves not remembering which class to go to next. “Is it Tuesday or Wednesday? Am I going to Geometry or World History?” Even more terrifying is the fact that I spent 12 years in Catholic school, being taught (for the most part) by nuns. However, I usually looked forward to returning, because I liked to learn, AND see old friends. Sadly, to this day I have nightmares about school, but usually they are the elementary school era, and the crumby little brats that made my life terrible, luckily, I had better friends in that time, outside of their influence, and extra curricular activities that didn’t make their taunting my entire 6th, 7th and 8th grade experience, actually, I met some of my ninth grade buddies in extra curriculars which probably made grade 9 easier. I do have dreams about being dropped back into high school, but none of my friends where there and its tough and sad to be in that blurred and made up memory, then I wake up and remember how much fun I had. 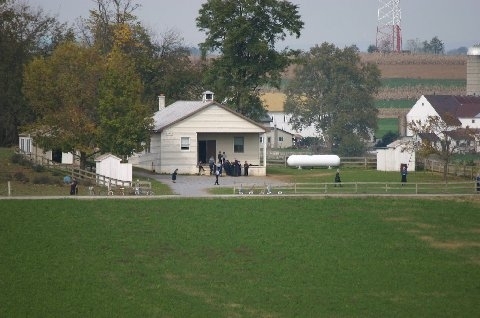 Some of the Amish pictures, above, show that the school experience, at least in appearance can be pretty well universal. Great pictures thanks for sharing. I enjoyed all of these pictures. 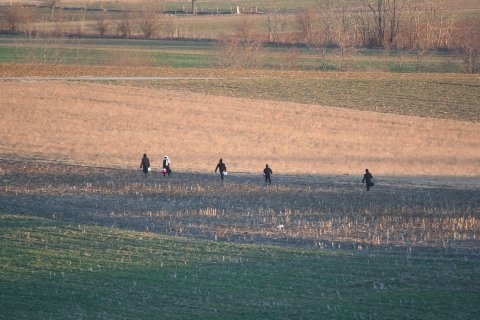 I was driving through the Orleans, Ind., settlement yesterday morning about 8, and saw several groups of children walking to school. I then passed the schoolhouse and heard the schoolbell ringing, and thought that the teacher was probably inside pulling the long rope to ring the schoolbell. A sound that is rarely heard anymore. and the kids all brought their lunch. About once a week, one of the mothers would bring a hot lunch for all of the students and teacher. I think this practice of one of the mothers bringing a hot lunch every so often is still practiced in many Amish schools. I had mixed feelings about the beginning of school. I was always excited to see who would be in my class that year and who my teacher wold be, but I really enjoyed being at home during the summer, even though I had a ton of household chores to do for my mother. I always dreaded the start of the school year, right up until the time it started; then I was generally excited about it. Of course, except for the last couple of years I was in school I always played football and the start of school meant the end of two-day football practices. That was a welcome break in the heat and humidity of Southeast Texas where I grew up. I generally enjoyed school, because my mom always told me that it would probably be a whole lot more fun than anything else I would ever do in life & that has been kind of true. Though when I wax nostalgic about school it is generally about college and not my primary and secondary school days. I am going to my 40th year high school reunion in about 3 weeks and that is exciting. It is the same day as Homecoming at our university so we will go to both. The U. is still where our focus is though. Between my wife and I, our daughter, our son and our daughter-in-law we have 9 degrees and 8 of them are from the same place, so it is a little near and dear to our hearts. PLUS my wife and I met there, our son and his wife met there so … when we think about the start of the school year it is the collegiate school year that we think about. Got carried away and forgot to acknowledge the fantastic photos. Thank you so much for sharing these with us. After two months off from school (July and August here in Belgium), I was always happy to return on 1st September. Mostly because it meant you got to hang out with your friends again every day. Also because after 2 months off, it was easy to get bored from being at home as well… At the beginning of the school year I’d also be very motivated to keep my notes very tidy etc. After the first week that was already less so… 🙂 And then I’d be counting down to the next break again. As for teachers: I know my teaching friends are usually looking forward to the start of the year as well. Two months (well, a little less for teachers) off is a long time for them as well, especially because other friends are still working so you can’t spend the day with a lot of people. Lovely pictures by the way! Thank you, Ed, for the school pictures. I wondered if these were taken on different days or seasons because there seems to be some variation in leaves on the trees, girls with black bonnets or without, children with coats or short sleeves, although it might make a difference when it warms up in the afternoon. In the last two photos, they seem to have water bottles instead of lunch boxes. Are they out for a special occasion, with the teacher included? Maybe a mother brought hot lunch that day. I find it interesting to see the changes in lunch buckets through the years. It seems school keeps starting earlier; it used to be after Labor Day. Crayons and paper smell new when shopping for school supplies at the back-to-school sales. “School bells are ringing once again. Already so soon! I see school children going to school. I just have to think how many changes have been made since I was in that stage of life. The one-room schools with his and hers shacks out back are only memories. Thank goodness for indoor toilets! The lunchboxes caught my attention. Way back when, we had no refrigerators in school or insulated lunchboxes with ice packs. It’s almost a wonder we didn’t all die of food poisoning. If we operated like that now, we would at the very least get quite sick. We had these metal lunchboxes with a space in the lid for a thermos. My wire to hold the thermos in place would come loose, then the thermos would fall down and smash my sandwiches and cookies. Seems to me they should have been designed to put the thermos on the bottom and the sandwiches on top. Fizzies are back. They were taken off the market due to the fact that they had saccarin (spelling?) in them. Then made a comeback, but again off the market as they had aspertame. The newest version has ‘splenda’ in them. Do a google search. I was talking to my son, Mark, and I found this interesting. 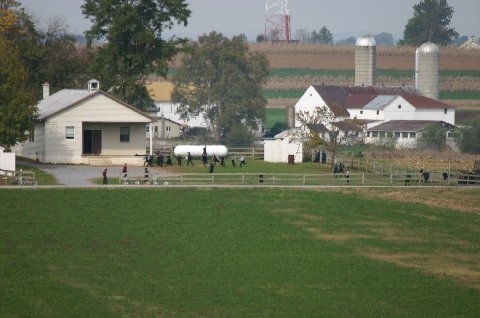 There are three Amish parochial schools in Mark’s community. Two of them started after Labor Day. The other school started a week earlier. The reason, the male teacher’s sister was getting married. Actually, Mark attended that wedding, yesterday. The boy wanted the week off to help his family prepare for the wedding. His sister, being the bride, the reception was going to be at their farm. Can you imagine a teacher in a public school getting the school calendar adjusted for personal reasons? Mark said that the wedding service was at the groom’s farm, which is across the road and down a little from the bride’s home. The groom’s parents’ farm is back a really long lane. Just about everybody drove their buggy over to the reception. 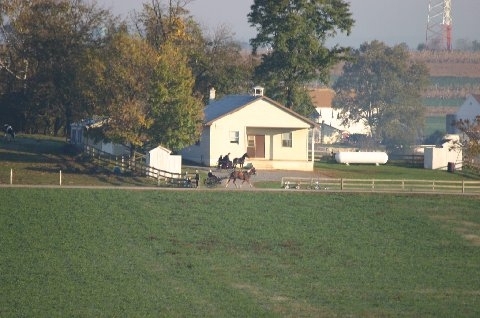 Mark said that there was an Amish traffic jam on the county road as all of the buggies came out in a long line and needed to turn left to go in at the bride’s parents’ farm where the reception dinner was. I was just curious why some of the girls were wearing their white caps and some weren’t. This was in the last picture. Thanks for your reply. I asked my son, Mark, about this. He said that in Lancaster County, PA it is the custom for the little girls not to wear their prayer caps for everyday. In Mark’s community the girls start wearing prayer caps as toddlers. If the girls or women are doing housework, gardening, or mowing the grass during the week they may sometimes wear a white or black head scarf. Otherwise they always wear a prayer cap. The school girls always wear a cap to school. That is just how Belle Center does it. In our (my wife and I) experience, that sounds correct. While we have seen even Lancaster County toddlers wearing prayer caps on occasion, it seems that younger girls are permitted to dispense with them or other head coverings in “informal” situations. We’ve seen “mixed” groups of girls where the smaller ones were uncovered and the older ones wore caps. We’ve wondered if it might not have something to do with an age milestone or possibly by personal preference. Lancaster boys, on the other hand, often are seen going hatless well into their teens. Wonderful pictures. Changing of the seasons. Great photo’s of the kids, the schools and the changing seasons.